Personalized One Photo Calendars Custom Printed in Bulk Promotional, Inexpensive. Provide your own photo! Budget Prices in the USA and Canada. 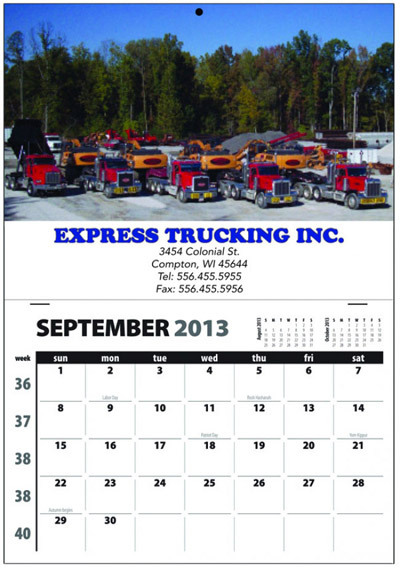 Wholesale advertising Photo Calendars with stapled Calendar Pad for easy tear-off. . Lowest cost in North America. Free Artwork Design. American Clients pay no taxes. PRODUCTION TIME: 8-15 days after art approval. Single panel, single photo calendar. Features full view of current month with standard holidays, and previous and next month mini calendar previews. Pad of 12 months is stapled right below top imprint for easy tear-off . Top drilled hole for hanging. Imprint Colors: Grids - grayscale only. Top panel - full color digital. Approx. Dimensions: 11" x 17"